Alexandre Lacazette will miss Arsenal's Europa League last-16 tie with Rennes after being given a three-match ban. The France striker, 27, was sent off for elbowing Aleksandar Filipovic in the first leg of Arsenal's tie with Bate Borisov. 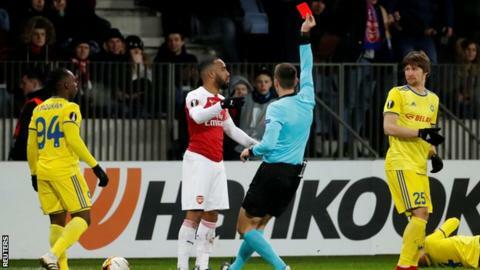 Lacazette served the first match of the ban in Thursday's second leg but will miss the Rennes tie after receiving a further two-game ban from Uefa. Arsenal beat Bate 3-1 on aggregate to progress after losing the first leg. Valencia's Geoffrey Kondogbia has been banned for two games for "receiving a yellow card on purpose" in the win at Celtic. Valencia also secured their progress on Thursday and were handed a last-16 tie against FC Krasnodar. Uefa said last week that it was investigating comments from Real Madrid defender Sergio Ramos after it was suggested he was booked on purpose late in Real Madrid's Champions League last-16 first leg at Ajax.